While I anticipated being carved up like a hapless captive at a Mayan religious offering last summer, I found the above photograph heading up an article in Traces, a magazine published by the Indiana Historical Society. They culled it from the photographic collection of one Robert Hamilton Scrogin, who was the principle driver of The Hoosier Motorist, a publication of the Hoosier Motor Club. Scrogins’ name was somewhere on that publication’s masthead from before 1919 to 1952. At that time, the rag served up club news, hotel and garage directories, trade news and travel articles. Traces notes that the Hoosier Club’s origins evolved from a group that called themselves the Flat Tire Club, a collection of “automobile enthusiasts” in Indianapolis. This was an apt club name in that era, since the club formed in 1902, when the horseless carriage was an adventurous hobby for members of the upper class. (In those days, wealth alone didn’t cut it. You had to be considered to be of good breeding, the standards for which were judged by those of…good breeding.) 1902 was a bit of a milestone year for horseless carriages. 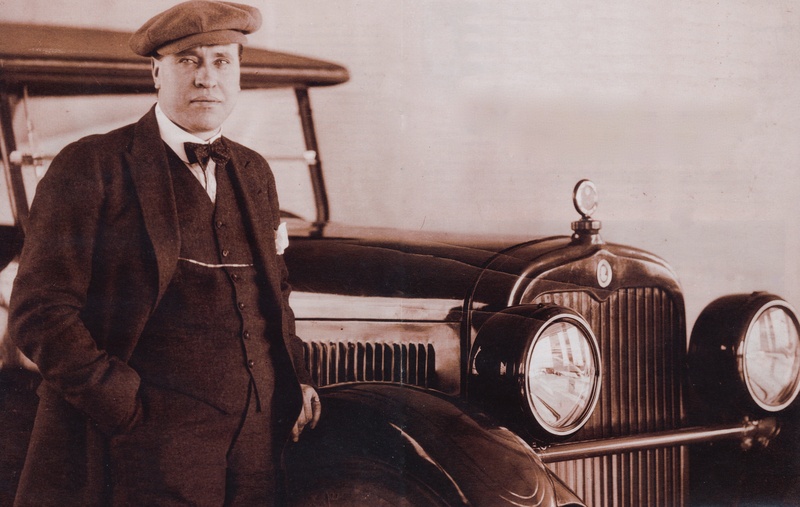 Ransom E. Olds was the first to build his almost-affordable and very successful Oldsmobile Runabout on an assembly line, no doubt noticed by Henry Ford, who was still struggling unsuccessfully to build and market more upscale vehicles. Prior to that, these conveyances were built one at a time, on one spot on the floor that was surrounded by parts bins. It might be rolled closer to other bins along the way, but that was about it. This earlier method was hardly crude, since the market for automobiles was exclusive to the more adventurous and technically-minded young men of wealth and society. Plus, the few craftsmen that built them had to be skilled enough in so many areas that they could handle everything from spoked wheel fabrication to motor assembly to padded leather upholstery. Little wonder that specialty companies soon sprang up to offer some labor-intensive subassemblies that manufacturers could choose from. By specializing, they were able to offer lower prices than could be done in-house, since their tooling costs were amortized faster and their labor did not need to be very skilled. They were able to make a profit on this approach, and manufacturers were glad to be offered a selection of equivalent parts without any tooling investment on their part, saving them money on both that and the lower cost via cheaper labor. You had to stay awake to avoid being at your supplier’s mercy in the event of some form of shenanigan, but overall, this system is still universally used today. Henry Ford ran into some nasty problems with this approach and made a heroic effort to keep it all in-house. It worked well, but he viewed it as more of an ideology, to avoid being at the mercy of others who do not have quite the same interest in your business’ success as you do, so it behooves you to try to pocket that profit yourself, if possible. His company shifted back to a reliance on suppliers after his death in the late 1940s. Automobiles were still very much experimental explorations of what might be possible, and were financially out of reach of any but the Old Money strata and a few professionals in the medical arts. The hope of keeping them running depended heavily on constant attention and maintenance on a level that we would find horrifying today. Granted, the ten or so years of one-offs and hand-built carriages had accumulated some 23,000 registered automobiles throughout the entire United States by 1902 (population 79 million), but these were the creation of hundreds of engineers, entrepreneurs and backyard tinkerers selling either low-production cars or lonely prototypes. There were dozens of manufacturers, and hundreds of both professional and amateur inventors. With a typical cost of $2,500 and up in 1902 (equivalent today to $68,000 to get in at the very bottom rung), this kind of money did not get you to work or the grocer. This had to be truly disposable income in the fullest sense of the word, and the expectation at that price was that you were getting the finest engineering and design along with the finest materials and workmanship available. State of the art stuff intended for the only people that were considered to be the only paying market. After all, you were approaching decent house territory for the cost of the average automobile. That business outlook has been resurrected recently as the economy has foundered, a century later. Follow the money. Yet it must be said that without the first moneyed buyers to reward all of the initial investment and development costs, the beginning of the automobile age might have been delayed by decades. That perception of who the market must be is why Ransom Olds’ 1901 Curved Dash Runabout was a game-changer. It represented the VW Beetle of its day. With its version of motorized carriage construction, it weighed just 650 pounds and sold for a dollar a pound. It was America’s best-selling car by 1903. Suddenly, the image of the motor car as a toy for the resented idle and/or snooty upper class began to blur a little, and would-be automotive tycoons began to smell opportunity for those daring enough to hop on board. However tiny the upper class might be, the middle class, small as it was at that time, was bigger. What’s impressive about that 23,000 cars is that “the first were the worst” for durability. Servicing was not relegated solely to the struggling mechanicals. Canvas and sheet steel over formed and carved wood typically defined body construction for years, since it made no sense to tool up for steel dies until sales/market volumes made it financially feasible to do so. I don’t think that happened in the fullest sense until Edward Budd came up with the first all-steel body in 1912, but he was a metal fabricator, not a car manufacturer. The Dodge brothers liked it enough to use the concept in their first 1914 car, its body supplied by Budd. Initially, all-steel bodies could not be made as large single-piece stampings, but had to consist of smaller pieces welded together and smoothed to make larger parts. Continual advances in steel fabrication techniques allowed larger and larger stampings over the years. However, there remained a large canvas-covered hole on car roofs, and in 1935, GM managed to purge that last remaining piece of canvas. That went over well with buyers, who were tired of treating the canvas section before each winter began. Back at the start, repainting their motor car had to be an annual affair for anyone with any sense of dignity, and this improved only a little for decades. Photos of cars taken in the 1920s usually show contemporary cars that look aged and worn, and the reason for that is the paint protection only lasted awhile. Finishes on the brightwork lasted much longer, but only with obsessive effort on the owner’s or chauffeur’s part. Early automobile enthusiasts could be expected to replace their ride with a new one annually, if not every couple of years. Similar to today’s electronics buffs, part of it was simply to own the latest and greatest, but plenty of it was to acquire a newer vehicle with more solved problems. All things considered, not too many of the earliest automobiles have survived their own era. They were unable to remain in use for long, advancements cascaded fast and furious up through the early 1920’s, and stocks of replacement parts no better than the originals dried up shortly after production of that model ceased (assuming there was actual production), or after the company went out of business. There were certainly plenty of those. An automobile ceases to have any reason for existing if it cannot run, and later metal drives in both world wars ate up both deceased motor cars and gigantic steam-powered tractors. If your car broke down on a cross-country adventure at that time, the only source of parts was to wire or mail the factory, which would ship them out to the nearest train depot. By 1902, investors and business mogul wannabes flocked around the potential presented by the “automotive industry” such as it was, and companies came and went in the quest for quick riches. It was common to be thinly financed with bad deals, and badly managed in an effort to stop the financial hemorrhaging that proper engineering and development created. Investors wanted their money back, and quickly. Production lead times had to be short, because a year of final development would also mean that whatever resulted was hopelessly obsolete the day it rolled out the door. As an example of the impractical nature of the new horseless carriage, the Traces article about the Hoosier Motor Club cites a common scenario. Since these fascinating new inventions were impractical for anything but chaparoned tours, and dirt roads going from one town to another were in short supply, club members would don their linen dusters, caps and goggles to head out on weekend trips together. Indianapolis to Richmond, Indiana was “only” 75 miles, but that was an arduous 2-day round trip. Perched on top of a vibrating box over four spindly wheels, their clothing, which may seem like an affectation toward fad fashion to our sensibilities today, served as a partial shield to weather and cold wind, pervasive dust, insects, thrown gravel, and oil vapor. You were protected against absolutely nothing, as far as gasoline buggies go. In those days, nobody of this strata exited their front door in T-shirts, shorts and flip-flops. No one pretended that it wasn’t raining when it was. The standards for respectable clothing were high, and decent clothing was neither easily cleaned nor cheap. To most folks back then, the idea of having a personal selection of clothing options filling closets and drawers would seem a wasteful and pointless absurdity. In those days, automobile clubs had bigger issues to face, given the road conditions and signage. 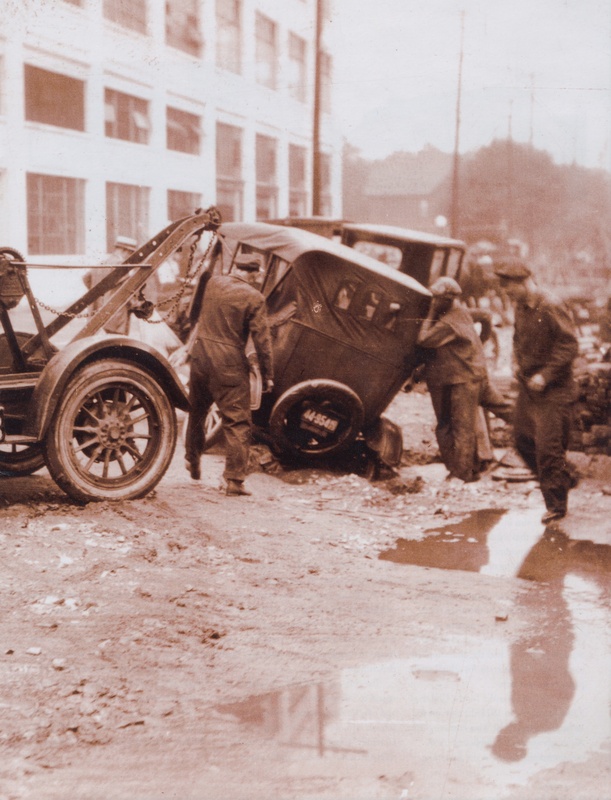 The Flat Tire Club changed its name to the Hoosier Motor Club in 1911, and that’s one of their tow trucks yanking out this car that has a wheel caught in an epic rut. …And we think potholes are bad! At any rate, such a long distance round-trip merited accompaniment by a service car loaded with extra gasoline, spare parts, and tires. For tires alone, autos typically carried at least a couple of spares, but virtually any trip of any length could be expected to puncture those. Just the one-way distance to Richmond alone could be expected to wear through one set of four, and while parts stores didn’t exist, neither did gas stations. Such fuels were typically obtained in cans at hardware stores, with gasoline not having much practical use compared to kerosene or fuel oil. Gasoline in fact was an unwanted byproduct of the refining process that wasn’t considered worth distributing, so it was often dumped anywhere that was handy, in quantity. It was good for nothing, and hazardous to store or use. Hardware stores and the like would stock it only when requested on a basis regular enough to justify the shelf space. The wise motoring enthusiast found a way to carry more than his vehicle’s tank would allow. Since it was an unwanted byproduct, gasoline quality was horrid then, and remained both bad and in short supply until the 1920s, when the refining process was changed to favor its greatly increased demand. By the teens, there had been much research and improvisation to find workable substitutes that were more available. The magical fuel-saving gadgets hawked most heavily around the 1950s are a direct descendant of both those memorable times and the fuel shortages of World War II. We’re all shaped by out experiences, whether circumstances change or not. Rounding out the trio of issues, early motor carriages represented a foray into the unknown, as far as engineering was concerned. The steam engine had been around for 200 years and the steam locomotive for 100, so there was no shortage of engineering talent per se. But the horseless carriage presented plenty of new and challenging tradeoffs on unfamiliar ground. Each backyard inventor or budding new business would wind up reinventing the wheel, since things like fasteners might exist, but not the best way to select and use them in what was essentially an off-roading horseless buggy. High-strength steel had not yet come into usage, so when common steel was used for frames or suspension components, its low strength had to be compensated for by using more of it, which increased stresses in a viscous cycle. Ignition and vaporizing gasoline in a practical way were new territory, and in 1902, anything went. Whichever way it went, everything – when it worked – was manual. You directly controlled ignition timing advance with a lever according to speed and load, and you directly controlled the fuel mixture so that the engine would neither stall nor put a hole in a piston. That was one reason why more familiar electric autocars greatly outnumbered “explosion motor” cars in 1900. Manufacturers had a vested interest in keeping technological secrets prior to production, and in that year two industry rag writers began to promote the idea of pooling knowledge in order to end the costs involved in everyone inventing everything all the time, some approaches working and some not. The Society of Automotive Engineers that resulted did not come into existence until 1905, with 30 members. Engineering standards needed to be developed, and a technical knowledge base needed to become available if the industry wanted to go from changing what was commonly perceived as a faddish hobby to building a viable transportation market. 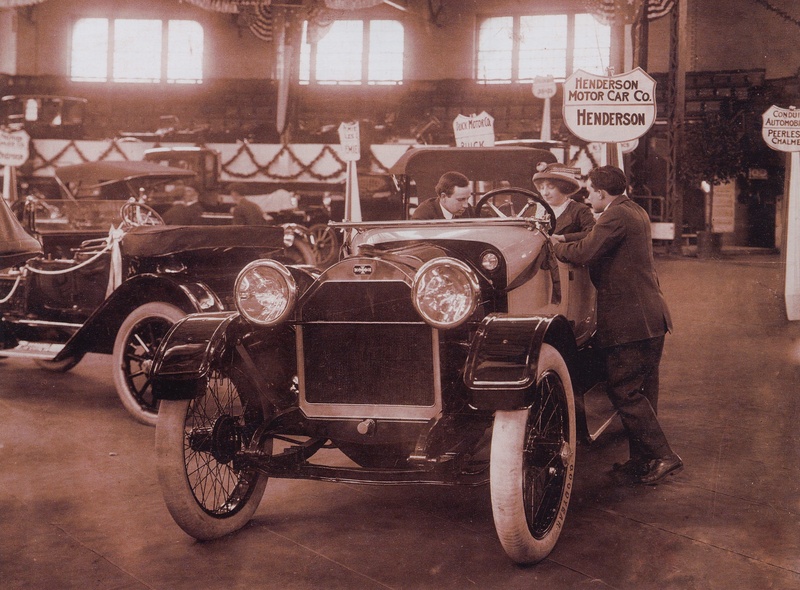 A Henderson motor car at the Indianapolis Automobile Show in March of 1913. That “new car smell” was leather in those days, not plasticizers. The SAE played an influential role in standardizing tests and measurements, as well as defining the adequacy of parts designed for automotive use. Its quest for conformity did not extend to systems or the whole, just for an understanding of what worked and what almost worked, in detail. Different brands of cars used radically different approaches to engineering design between 1900-1925, the overall design for motorcars not gelling until the early 1920s. In all that time, very, very few bothered to catalogue the state of the art, mainly because it kept changing so quickly that any such reference would be woefully obsolete by the time it got published. I have a book called The Gasoline Automobile, published in 1919, and a six-volume set of Automotive Engineering, published in 1920, which specifically cites the problem. Dry in sections, and fascinating in sections, they each illuminate aspects of a very different attitude and culture than we wallow in today. That brings me back to Mr. D. McCall White, whose portrait graces the top of this post. I don’t know when he was born or where, but I do know that he began his engineering career in Glasgow, Scotland, and that he arrived on these shores in 1914. Rather than being the newbie who fetched coffee and learned the ropes, he promptly designed the first high-speed V8 engine for Cadillac. Given the metallurgy, fuel and lubricants of the time, this was no cakewalk. Unlike today, high horsepower at high engine speeds was considered to be a debatable improvement. Those qualities were bragging points in marketing, but in the United States, a mix of adequate power with an ability to stay in high gear from walking speed to top speed was the stronger preference by drivers. Neither automatic transmissions nor syncromesh gears existed, so the goal was to launch, clunk into high gear as soon as possible, and stay there. A flat torque curve was the champion of the day, not horsepower. White designed high-RPM engines, but felt that although that route was popular in Europe, with its trend toward smaller engines, that it did not wash in the U.S. as a goal across the board. A significant boost in horsepower netted only a few more miles per hour at the top end due to the greater air drag, and in practice, our roads were such that very few hardies were willing to hazard and hold 70 MPH on them. Why subtract drivability in order to gain speed that you’ll never use? That was the issue. McCall White became so active and prominent in the field by 1920 that he partnered with Charles Nash (of Nash Motors) to create the Lafayette Motors Company in Indianapolis, which explains Traces‘ interest in him. Indiana and Indianapolis in particular was once the dominant hub of the automotive industry, and the Indianapolis Speedway was their test track. The new brand was intended to join the lineup of “high quality” prestige automobiles like Pierce-Arrow and Packard, but the times being what they were, production was transferred to Nash plants in Wisconsin two years later, was then handed over to Mr. Nash in 1924, and he promptly killed it in order to use the line capacity for his more profitable Ajax brand. Nash revived the name in 1934 for a less expensive car. Some machinations followed which morphed the freestanding brand in to just another model of Nash, and from 1938-1940 the Lafayette was Nash’s cheapest model. It went into oblivion after that. I like to think that White had long since just let the whole thing go and moved on…because he certainly did move on, but it’s plain that he also accepted the basic nature of the business. White’s career was long and influential, culminating in the late 1940s in what he found to be a frustrating run with Preston Tucker, who promised him “full and final authority in all matters pertaining to both engineering and manufacturing”. After having worked in just about every possible management position in many car and aircraft concerns over the world, White was elderly but still sharp by this time, and his task here was to finalize the Tucker car design and bring it into affordable production – hardly a daunting task for someone with his abilities and experience. White arrived somewhat late in the game and saw that the Tucker automobile was neither completely engineered nor in any way ready for production. But that wasn’t the problem. The problem was that the organization within the plant was a self-sabotaging mess. There was no chain of command, departments were duplicating each other’s efforts despite lethal time and money constraints, and engineering managers refused to cooperate with each other when they didn’t like each other. White expected that his new authority would help, but soon found that whenever Tucker was absent – which was a lot – no one followed Tucker’s orders, let alone his. They did what they liked. Worse, Tucker would give orders contrary to White’s whenever he disagreed with him, which is counterproductive after you’ve decided you will pay big bucks to tap into a vastly more experienced man’s expertise. It also invalidated White’s authority to get people to do things. That Tucker was passionately mismanaging the company was not a secret from anyone, particularly the Board of Directors. White was urged to join the Board if he would reign in Tucker, but he refused unless they were also willing to cripple Tucker’s overall authority. That was a no-go, so White stuck with doing what he could to get the car ready for production, and the rest is history. The movie about the Preston Tucker and his car lead one to believe that Tucker was done in by the Big Three and the SEC, who seemed to be pursuing persecution more than oversight. Those are both true. The press initially loved the car, but eventually found better stories in peddling false rumors about the car, which fed the SEC’s interest in possible fraud. Preston Tucker was a genuine person, likeable and very persuasive, but I suspect that a long string of failures to sell his inventions and improvements to the military over the years made him desperate enough for a career success that he could not help but try to address it all himself. He was unable to manage the bright, hand-picked people working for him, putting his hands on the controls when and where it was most needed, and yet was unable to take his hands off the controls where his own judgement was weakest. There’s a universality lurking in there somewhere. So, a gander at one impressive photograph of a man standing next to a car that he designed inspired some thought and more research on my part. Although I expect to resume writing about my questionable travels and the payback from some of my own recent inept decisions within the month, you’ll have to make do with considerations like the above for now. I can’t help myself. I still remember him changing from a “summer” to a “winter” thermostat, and new antifreeze every fall. Very interesting bit of history, thank you. Wow! That he had a 1937 Nash Lafayette, unbelievable! That he was badly underpaid as a school teacher, completely believable! I’m glad you enjoyed the post, Mary. Thanks! The statement that we don’t know what we don’t know appears to apply to Tucker’s management. How can you correct something you don’t know is wrong? Amen! I’ve certainly been bushwacked by that truth as I’ve come along my path, Linda, and it can be frustrating to finally discern that something is awry, but then not even know what questions to ask. When something passes silently through the mental filters we set up to understand life and operate in it, it’s the fortunate person who recognizes that something is involved that he/she hasn’t been perceiving – until now. Simply sensing that is the biggest step, I think. Wow. Well written article. Thank you. Thank you for that, Mr. I tend to write in a stream of consciousness manner, which tends to wander about a bit as I go along. A real writer would go through it several times to organize it, cut out the diversions and keep it concisely to the point, but I can only let it flow. For me, editing just fleshes out those diversions, so by the time I hit the “Publish” button, I’m happy with it but also grateful that I can’t be fired for writing in this style! I can’t seem to subtract, but can only add as more things come to mind. I’m just glad that you enjoyed the result as much as I enjoyed the process.